Protecting your technology. 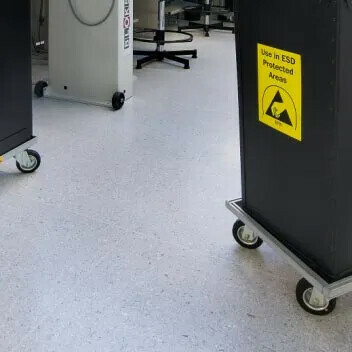 Forbo Colorex ESD & cleanroom flooring is an advanced technical flooring system specifically designed to control static discharge in sensitive areas such a cleanrooms, operating theaters and the electronics industry. Colorex is not only functional, it is also aesthetically pleasing in bright, fresh colours. Colorex EC is Ideal for laboratories, IT-rooms and cleanrooms . Colorex EC satisfies the strictest requirements for particle release behaviour, helping to reduce any threat of contamination. Colorex Basic Plus is a loose lay floor system with Colorex on top without conductive properties. This ensures all the benefits of Colorex like high density, easy repair and stain resistance. But also combines the benefits of a heavy duty loose lay tile. The Colorex collections offers a premium brand of conductive and static dissapative high density dimentional stable tiles. R11 Plus floors have enhanced slip resistance, categorised as R11, because of the strong surface embossed structure. Colorex EC Plus is Ideal for quick installation and renovation of sensitive areas such as laboratories, IT-rooms and cleanrooms . Colorex EC Plus satisfies the strictest requirements for particle release behavior, helping to reduce any threat of contamination. 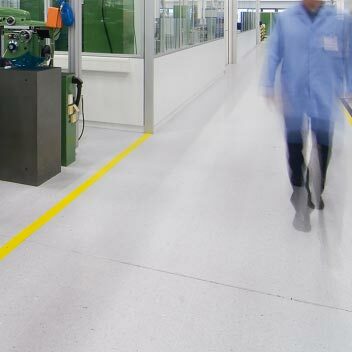 A loose lay floor system with Colorex on top with limited conductive properties. This ranges provides all the benefits of Colorex like high density, easy repair and stain resistance with the benefit of a heavy duty loose lay tile. Shops, stores, warehouses. Areas with high traffic needing daily intensive cleaning. Included with enhanced slip resistance, categorised as R11, because of the strong surface embossed structure. We make tiles in order to ensure consistent and unique properties and to overcome problems that can be fatal like emission, shrinkage and diminishing of conductive properties. Tiles can be installed more quickly and easily than sheets and with less waste, especially in small and medium areas or rooms with irregular shapes. 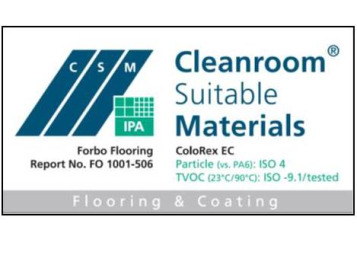 Colorex provides all the features normally associated with ESD sheet product but with the additional benefits mentioned above that the tile format offers. 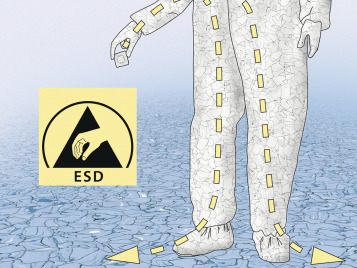 ESD sheet products require a high plastisicer content which can result in out-gassing. In contrast, Colorex tiles have a small percentage of placticer content and as a result, very low outgassing. Static charges flow easily through the dense network of tiny conductive veins in the whole thickness of the tile. These are collected by the conductive adhesive and securely discharged to earth via the copperstrip. It’s a completely natural system that needs no volatile, chemical anti-static additives to aid conductivity. The conductivity is completely independent from moisture in the air. Permanently conductive floor, connection between tiles through conductive adhesive and connected to earth through copper strip. Compliant to person-shoefloor-system requirement. 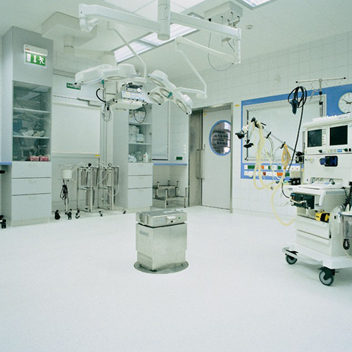 ESD facilities, cleanrooms, pharmaceutical laboratories, production sites and operating theatres. Renovating an industrial floor can be a very costly and labour intensive endeavour. The downtime needed to move or disassemble heavy production equipment and the cost of a complex subfloor renovation can begin to add up before work on installing the new floor has even started. 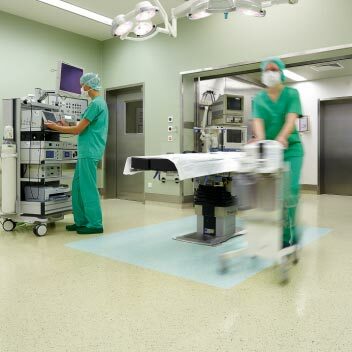 Colorex EC plus is a high performance floor covering system that consists of loose lay tiles. 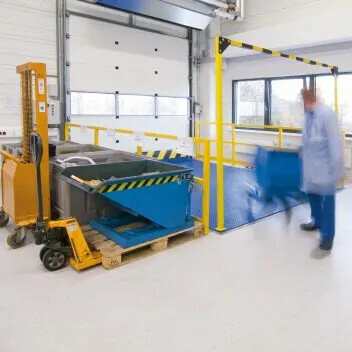 Suitable for applications where expensive preparatory measures and downtimes are not acceptable, it can be installed without interruptions and is immediately accessible. There’s no need for special subfloor treatments or preparations. The tiles connect to each other using a unique dovetailing system that remains hidden. But because they have a genuine Colorex surface you can still take advantage of its proven features and benefit. Permanently conductive floor, connection between tiles through dovetails and connected to earth with copper strip. Compliant to person-shoefloor-system requirement. 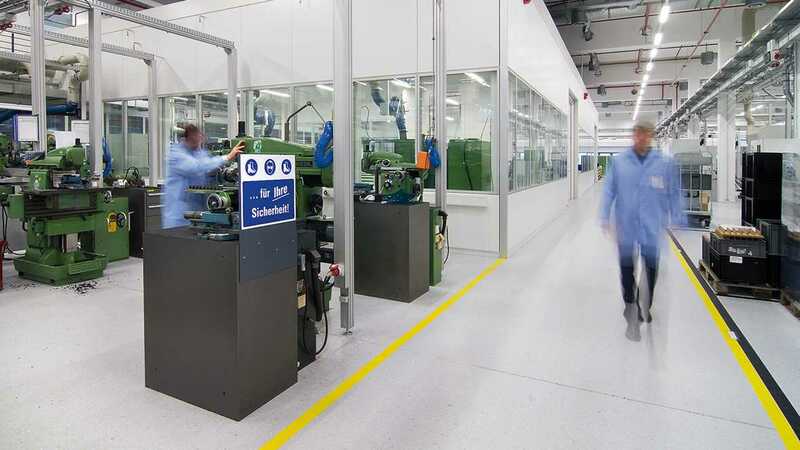 Renovation of ESD facilities, cleanrooms, pharmaceutical laboratories and production sites. Suitable when down time or raising moisture are critical. 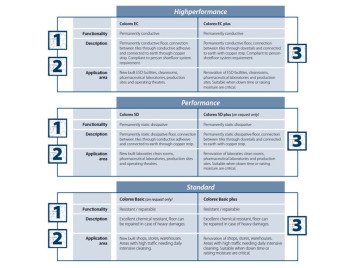 Choose here the level of conductivity that fits best in your application. Colorex can be used everywhere. It can be installed by directly glueing it on concrete, as part on top of a raised floor panel or as a loose lay tile system. All versions come in two levels of conductivity: EC Highperformance and SD Performance. The loose lay version additionally has an anti static (Basic plus) and slip resistant (R11 plus) version to complete the high tech solutions offer. With Colorex EC and Colorex EC Plus static charges flow easily through the dense network of tiny conductive veins in the whole thickness of the tile. These are collected by the conductive adhesive and securely discharged to earth via the copperstrip. It’s a completely natural system that needs no volatile, chemical anti-static additives to aid conductivity. 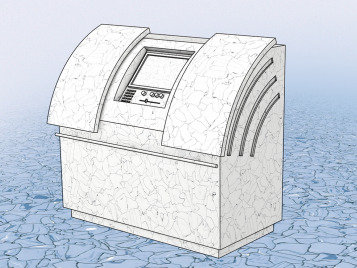 The conductivity is completely independent from moisture in the air. Colorex SD enables safe electrostatic discharge through the whole thickness of the tile. The conductive coating forms a dense network of tiny black veins. Colorex Basic plus is a loose lay floor system with Colorex on top with limited conductive properties. This ranges provides all the benefits of Colorex like high density, easy repair and stain resistance with the benefit of a heavy duty loose lay tile. 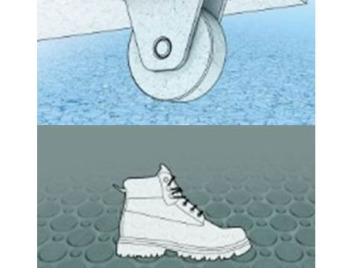 Enables safe electrostatic discharge through the whole thickness of the tile. The conductive coating forms a dense network of tiny black veins. New built laboraties clean rooms, pharmaceutical laboratories, production sites and operating theatres. Colorex SD Plus is available on request. In order to provide our customers with highest safety, we measure and report the conductivity of each production batch. As a result of this quality control procedure, we establish a measurement report showing the distribution of conductivity values within a single batch. These reports are available to the customer upon request. Click below to download warranty!